From mid‐August to mid‐October air temperatures and warm, damp soil conditions promote vigorous root growth. A good rule of thumb: plant by Columbus Day weekend! Plants need at least six weeks to establish before the ground freezes! Choose moderately sized deciduous trees and shrubs that will establish easily. Choose healthy, container‐grown or ball and burlapped plants. Trees that establish easily include ash, alder, elm, catalpa, crabapple, Eastern redbud, maple, horsechestnut, hackberry, hawthorn, honeylocust, sycamore, and linden. Pine and spruce will do well if planted before the end of September while the soil is warm. Most deciduous shrubs will establish easily in the fall, but wait until spring to plant broadleaved evergreens such as rhododendron and narrow‐leaved evergreens such as yew. Look at your site carefully before you choose a plant. Is it sunny, shady, or partly sunny or shady? Is the site protected or exposed to wind? What size is the space you want the plant to fill? Ask your local garden center to help you choose the right plant for your site. They will know what plants grow well in your area and will help you match the needs of the plant to your site. Plants with no significant pest problems, drought tolerance, no invasive tendencies, and beauty in at least two seasons top the list. Measure from the trunk flare of the plant to the bottom of the root ball or mass, and dig a hole that depth. Planting too deeply may cause the plant to die! Measure the width of the root mass. Loosen and remove the soil from a bowl‐shaped area 2 ‐3 times wider than this measurement. It’s helpful to place the soil on a piece of plasic or plywood to make it easier to return to the hole. Gently loosen any roots that are wrapped tightly around the root ball of plants from containers. Remove wire, string and the top half of burlap covering from around the root ball. Set the plant so the trunk flare is at, or 1” – 2” inches above, the existing soil level. Use the native soil to fill around the roots. If the soil is light sand or heavy clay, mix in some peat moss or compost. Water the soil half way through backfilling and allow it to drain before finishing the backfill. 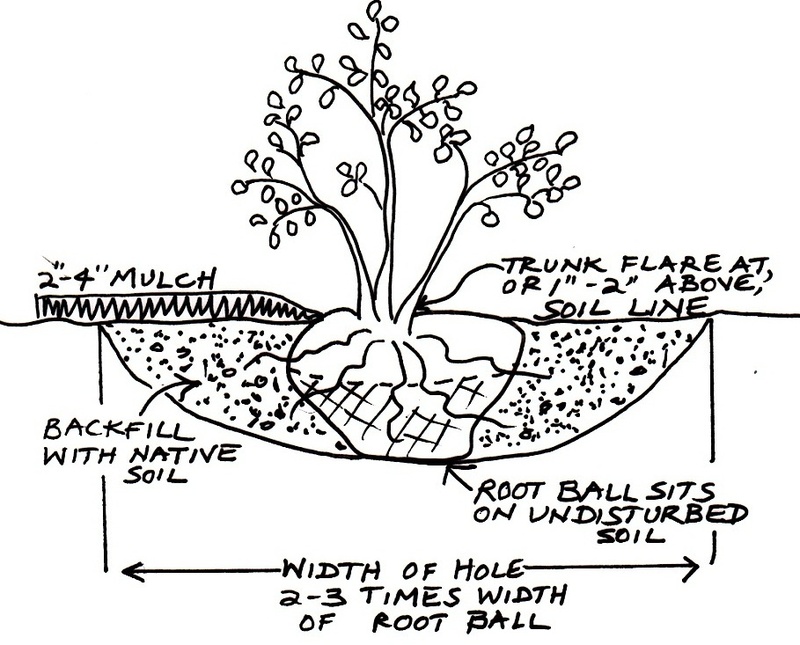 Water the rootball and planting area immediately after backfilling. See Growing Tips 9 for more on care and maintenance of your fall plantings.